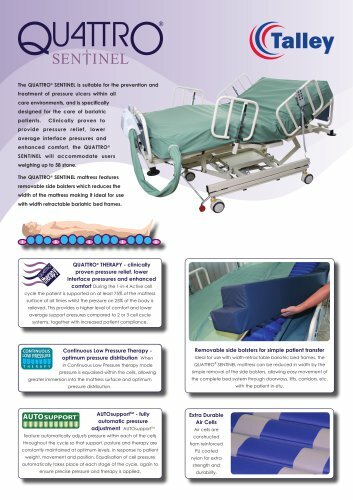 The QUATTRO® SENTINEL is suitable for the prevention and treatment of pressure ulcers within all care environments, and is specifically designed for the care of bariatric patients. provide pressure relief, lower average interface pressures and enhanced comfort, the QUATTRO ® SENTINEL will accommodate users weighing up to 58 stone. The QUATTRO® SENTINEL mattress features removable side bolsters which reduces the width of the mattress making it ideal for use with width retractable bariatric bed frames. QUATTRO® THERAPY - clinically proven pressure relief, lower interface pressures and enhanced comfort During the 1-in-4 Active cell cycle the patient is supported on at least 75% of the mattress surface at all times whilst the pressure on 25% of the body is relieved. This provides a higher level of comfort and lower average support pressures compared to 2 or 3 cell cycle systems, together with increased patient compliance. Removable side bolsters for simple patient transfer Continuous Low Pressure Therapy optimum pressure distribution When Ideal for use with width-retractable bariatric bed frames, the in Continuous Low Pressure therapy mode QUATTRO® SENTINEL mattress can be reduced in width by the pressure is equalised within the cells, allowing simple removal of the side bolsters, allowing easy movement of greater immersion into the mattress surface and optimum the complete bed system through doorways, lifts, corridors, etc, pressure distribution. with the patient in-situ. AUTOsupportTM - fully automatic pressure adjustment AUTOsupportTM Extra Durable Air Cells Air cells are feature automatically adjusts pressure within each of the cells throughout the cycle so that support, posture and therapy are from reinforced constantly maintained at optimum levels, in response to patient weight, movement and position. Equalisation of cell pressure automatically takes place at each stage of the cycle, again to ensure precise pressure and therapy is applied.